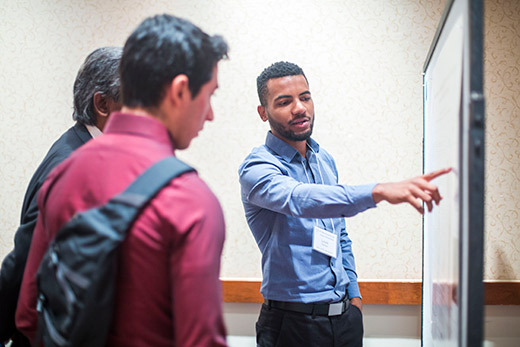 Convened by Emory's Laney Graduate School, the STEM Research and Career Symposium welcomes students from underrepresented groups to campus Oct. 2-3. The Emory community is invited to attend student research presentations and help showcase the university. Convened and organized by Emory's Laney Graduate School, the annual STEM Research and Career Symposium will welcome more than 100 students from underrepresented groups to the Emory campus Oct. 2-3. Participants will include outstanding undergraduates intending to pursue the PhD or MD/PhD, as well as graduate students seeking postdoctoral opportunities. In addition to networking and recruitment opportunities, students will also hear from two keynote speakers: Leslie Caromile, professor at the Center for Vascular Biology at the University of Connecticut Health Center, and Kenneth Gibbs, program analyst in the Office of Program Planning, Analysis and Evaluation at the National Institute of General Medical Sciences. Additionally, students will present their research in a wide variety of scientific categories through both oral and poster presentations. These scientific sessions — taking place at the Emory Conference Center on Monday, Oct. 2 — are open to the Emory public. All Emory faculty, students and postdocs are invited to attend to help show the excellence and hospitality of Emory.